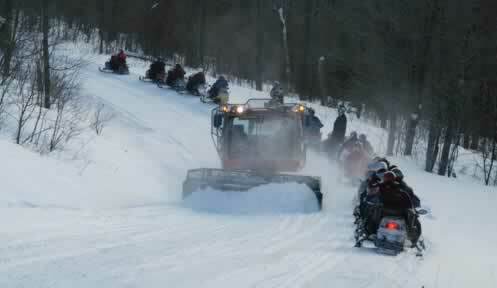 Snowmobiling in New Hampshire has become one of our most popular forms of winter recreation. New Hampshire has some 6,900 miles of snowmobile trails throughout the state. Learn why it's important to stay on designated trails. Many residents and visitors also enjoy using OHRVs. Riding Off Highway Recreational Vehicles (ATV's, UTV's and trail bikes) is an increasingly popular trail use in New Hampshire. Roughly 1,200 miles of trails are open for summertime OHRV riding. For trail maps and information on conditions, contact the NH Trails Bureau (603) 271-3254. The Bureau is operated by the NH Department of Natural and Cultural Resources. Another good resource for maps and trail conditions is state and local snowmobile and ATV clubs. Did you know that New Hampshire has a State Park that provides opportunities for miles of trail riding for ATV, trail bike, and snowmobile enthusiasts alike? Learn more about Jericho Mountain State Park in Berlin, NH.